Transgressor is the ultimate drum manipulation plugin. You will no longer be limited by the sound of your drums. From subtle enhancement to complete overhaul, Transgressor gives you quick and easy access to dial in your drum sound without limits. Transgressor is the new standard of transient design. While transient designers let you control the level of your transients, we found that approach just never gave us the results we were looking for. While adjusting the level of transients can certainly impact your sound, the real power comes from being able to EQ your transients and sustains separately. 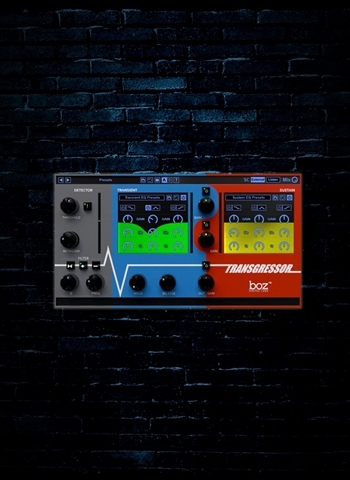 Transgressor gives you 2 EQs. One for your attack and one for your sustain, letting you shape exactly the way you want your attack to sound. Whether it’s hard hitting, tight drums, or big sustained drums, Transgressor lets you dial it in exactly the way you want it. Do you want to add bite to your snare without increasing the snare buzz? Transgressor is your go-to plugin for this. Do you need to reduce the ringing in your snare without changing the tone? Surprise! Transgressor does this easily. In addition to giving you full control over the sound of your transients, Transgressor adds another layer of creativity by letting you use the detector with an external sidechain. This lets you adjust the EQ and sustain of any instrument being triggered by another.